Hydraulic Winches - Thern Heavy Duty Hydraulic Winches | Thern, Inc. While only one of our popular winches comes standard with hydraulic power, we can modify virtually any of our power winch offerings to meet or exceed your hydraulic power requirements. From small utility winches to huge capacity winches, our experts have converted hundreds to hydraulic power to meet our customer’s demands. If your application calls for hydraulic power, rest assured that Thern can accommodate your needs. 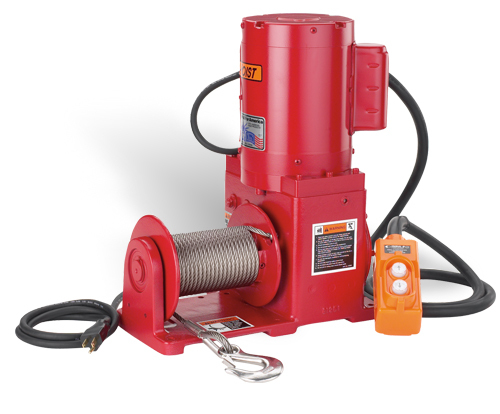 Thern offers the 4771HY hydraulic winch with 2,000 lbs. capacity on the first layer of 5/16” diameter wire rope, 1,500 lbs. at mid-drum and 1,200 lbs. at full drum. We also offer custom engineered hydraulic solutions for just about any of our electric winches. All of Thern’s hydraulic winches can also come with a variety of custom controls from fully hydraulic manual lever and remote pilot control to electric solenoid control. These controls can also include additional safety features such as an E-stop, rotary travel limits, slack line detection, load limiting, speed limiting, and redundant breaks.